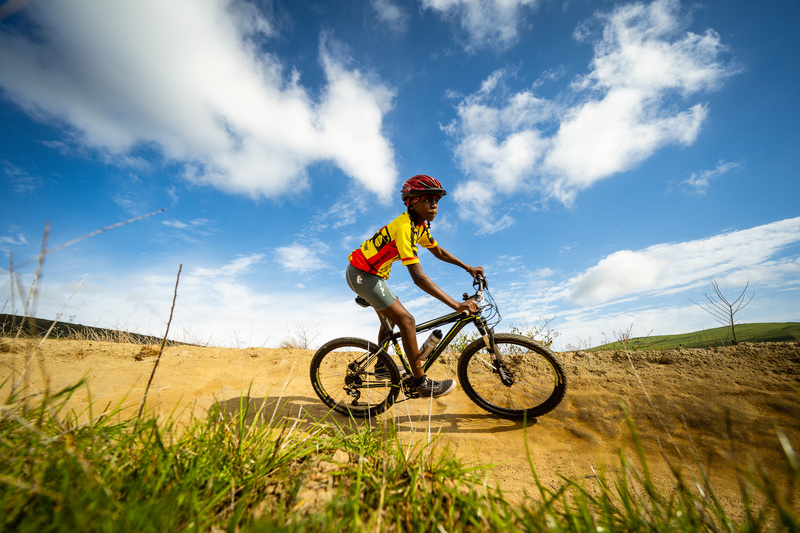 The Spur Schools Mountain Bike League, managed by the NGO, Amarider, is seeking to introduce mountain biking to new schools in order to further grow our rider base. Our 2022 vision of 20% merit based PDI participation at our National Final is a bold one. Schools need to qualify teams by participating in a very competitive provincial League season. We not only have to resource these new teams with equipment, but also build teams strong enough to compete against established campaigners. This is not achievable overnight but is going to require a concerted and sustained effort. We recognize that access to equipment is a real obstacle to new schools who want to get involved and for this reason a Singlespeed League is being introduced. The aim is to build a platform of regulated and governed competition, where the need for expensive equipment is neutralised and make mountain biking an accessible mass participation sport for all scholars. One of the greatest challenges to the promotion of sport in South Africa is accessibility. If all South Africans had access to sport equally and equitably there is no reason to believe that South Africa could not bring home as many gold medals as any other nation. Traditionally access has been defined as getting children to sport. This usually involves loading children and transporting them to an event that’s organized either at a school facility or an adjacent community. Transport costs, access to sporting equipment and team size are the deciding resources in determining how many children can participate, excel and show their true potential. Our current approach is one of invitation. With the Singlespeed League our approach will be one of active talent identification. Various development initiatives across various sporting codes attempt to address this access inequality with various levels of success. In most cases the interventions take the form of handouts and have a short-term effect. While the major codes like rugby, soccer, athletics and cricket have a well defined path to nurture discovered talent, these codes are also over-played and the odds of breaking into the competitive environment is small. Mountain biking and cycling in general provides a much wider mass-participation opportunity. Over 200 riders line up for a World Cup Mountain bike race, 180 riders compete in the Tour de France, 1200 compete in the Absa Cape Epic. It is clear to see that the odds of participating in these events are much better than playing in a tennis final. In fact, we are already seeing our riders consistently participating (and placing) at this level. To identify talent, you need to spread the net as wide as possible. In practice, the spread is only as realistic as a budget allows. We need a model that allows for reach, while staying affordable. Further, we need to ensure that the project has well defined goals and outcomes. 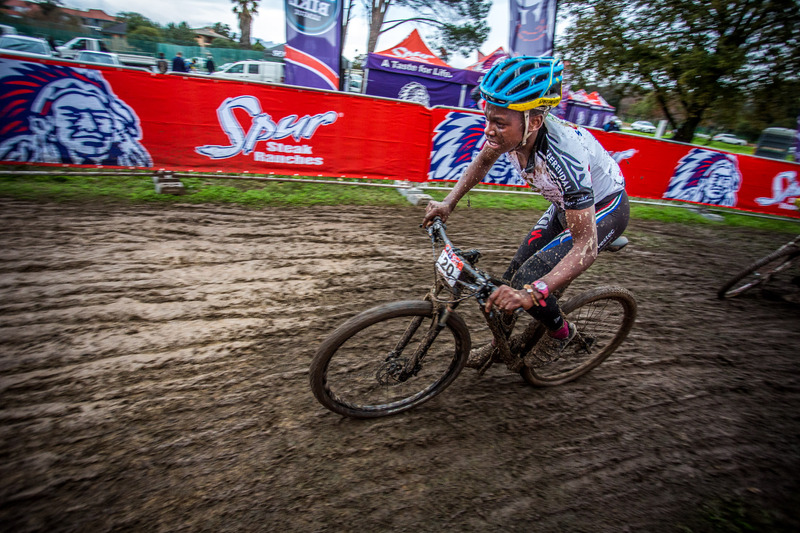 In terms of talent identification and reach, the Spur High Schools MTB League has no equal in the SA sports environment. With over 5000 active participants generating over 12000 entries it covers every province, has a well defined end goal, celebrates teamwork and is positioned as the premier cycling competition for South African scholars. While the Spur League is a great success it is challenged by the fact that those that participate has the means to do so, and also the ability to participate at the level of speed and skill required to be competitive. A new school will face a difficult path to reach qualification to the National Final, with the fastest progression from start-up to Finals being 3 years. We need an introductory platform of grass roots racing that can prepare and nurture young riders and their schools to develop into competitive League teams. Most large school sports require the construction of expensive infrastructure like pitches, courts and pools. You can stage a grass roots mountain bike event almost anywhere without the requirement of a dedicated and maintained course. 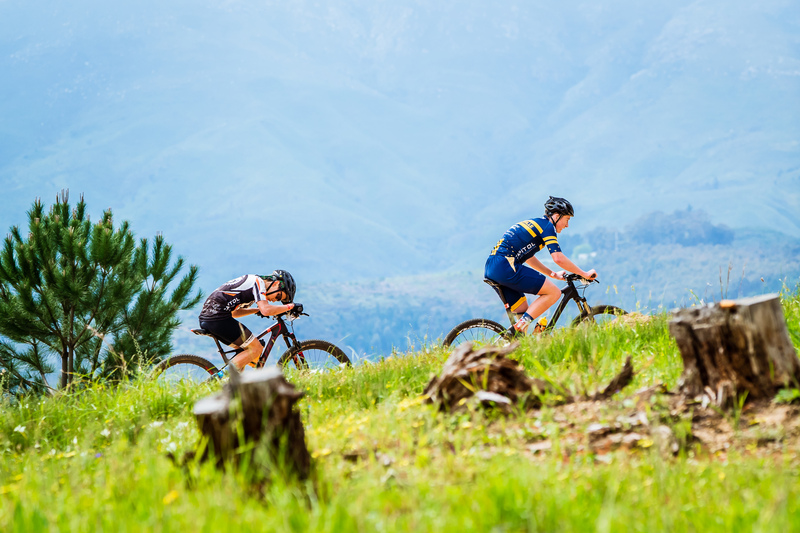 Once a rider or team progresses there are countless mountain bike events countrywide to participate in, so from an logistical point of view the only issue is transport, equipment and coordination. Equipment is of course the major concern when it comes to a mountain bike program. The introduction of racing on a singlespeed bike cuts the cost tremendously and allows the program to develop extensively before equipment becomes a debilitating factor to performance. Once riders and their teams have shown ability, commitment and perseverance on these entry level machines, the progression to proper equipment can be addressed. where a once veteran heavy sport is now turned around to a bottom-heavy, scholars environment. This bodes well for the identification of future talent and the sport is already seeing early results. Over the years, the League has been focused on constructing the road map for schools mountain biking. This has not been easy as we had to navigate existing programs, develop the rules and guidelines, as well as build the local structures essential to run the program on the ground. Although there is still much to do, as a grass-roots initiative we feel that enough has been done to start focusing on our two areas of perceived risk to the sustainability of the League. The first is the unfortunate reality that a lack of structure for racers after they leave school is causing many promising riders to lose interest and leave the system. The second is that the League’s demographics does not reflect the diversity of the South Africa population. This is not only in terms of race but also financial means and general access to the sport. Mountain biking is not a cheap sport and it is further centered around major centers. Many regions are not reached. When deciding on which of these two areas of to focus the League decided to stick to our grassroots focus and get more kids on bikes! While the League will instigate and initially resource this next tier of participation as far as possible, our sponsor cannot be expected to fund this component, hence our aim to develop a program that is scalable and backed by corporate and government support. The Single Speed Mountain Bike League is turning the traditional model on its head by creating a mechanism of bringing the sport to the children. A mountain biking event can be created in any community. Pop-Up events! A mobile race unit of 25 bicycles can facilitate a racing event that can cater to 150-300 children on a day. This mobile unit is a turn-key mountain biking event solution: providing everything from mountain bikes, helmets, branding, guide tape, marshal vests, PA system and prizes. What makes this unique is this resource is not left there, as in a traditional model, but mobile so it is used, or shared, over and over throughout many communities. 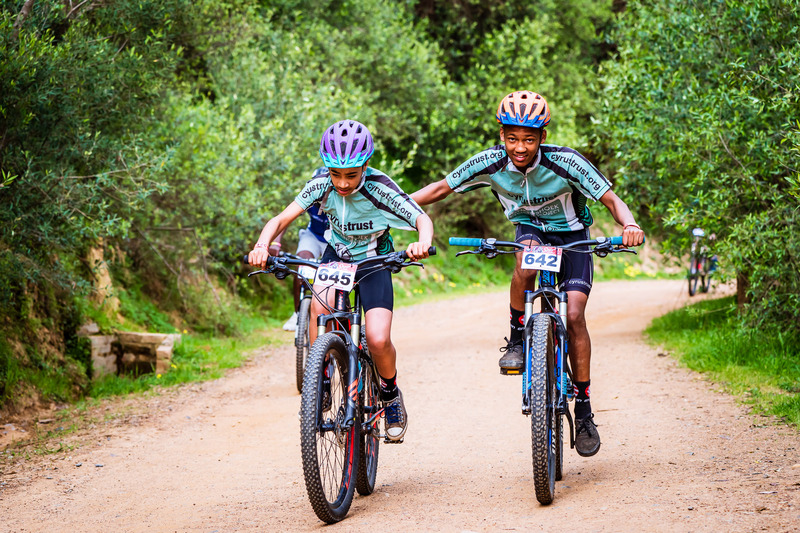 After each event, a local school team is selected and resourced with equipment to set up a schools’ MTB club and participate in a series of regional events. This includes bicycles, helmets and kit. The winning teams of this regional competition, progress to a provincial Singlespeed Final. At this level school teams can also start participation in regional Spur Schools League events. Winning schools at the Singlespeed League Provincial finals receive proper racing mountain bikes for participation in the Spur Mountain Bike League. By forcing everyone to use the same type of bicycle, a competition can be designed that levels the playing field regarding technology and equipment; quantifying who is the best irrespective of economic class. The principle of standardized and regulated equipment is of course common in sports, ranging from athletics to Formula 1 racing. A unique way to bring equal competition in a time of economic diversity. In the past, the League has taken a reactive approach to transformation by supporting teams with transport costs, race entries etc. To achieve our 2022 target will require a proactive approach. The League does not plan on reinventing the wheel but will rather look, where possible, to partner with existing initiatives to achieve our 2022 goal. There are numerous programs around South Africa operating in this space, however they are primarily focussed on ‘Kids-on-Bikes’ activities. The League aims to plug our ‘competition’ program onto these initiatives. We believe that the structure/path the League can provide will be hugely beneficial to any grassroots program and will be a catalyst to the development of more programs. 2) Focus on teams, NOT individuals. a) 1st prize is that these team riders all represent one school. Firstly, the Spur League is an inter-schools competition so we want all structures to mirror that of the National Final. b) We have run into growth issues in terms of development where teams like Diepsloot Academy and Songo have participated and basically can not expect an outcome in the League as they represent multiple schools. These academies represent big communities and we believe many more riders could be exposed were they able to represent their schools. This of course does not mean that Academy riders are not welcome in the League, but we to start driving participation under school banners. c) In a team competition, depth is essential. It does not help having the best rider in the country but he/she has no teammates to bring in the points. It therefore has an ‘averaging’ effect on the skill/ability/proficiency required and levels the playing field tremendously. d) We want corporates to get behind their local communities. Our belief is that structuring the competition to focus on the TEAM and not individuals will unlock the grassroots support required to get these teams mobilised. e) The success of soccer is the fact that even your smallest local teams develop a brand, colours and supporters. People like to belong to, and support a brand. The USA sports model from High School through collegiate and eventually pro sport is testament to this concept. The League and its sponsor, Spur Steak Ranches, is focussed on producing the ‘end goal’, a series of provincial qualification events in all provinces culminating in a National Final. This covers around 60 events annually. The budget to produce this is large. That said, we are painfully aware that while the League is successful, it does not scratch the surface in terms of potential participation or undeveloped talent. To identify and nurture this talent cannot be the role of Spur, as not only will the budget spiral out of control, but the sustainability of the project will vest with one entity. We need to find external support, from external sponsors, government and other supporters to partner with the League in order to develop this grass roots base. There are a number of organisations already doing great work in this space, it is simply a matter of providing guidelines and goals to integrate these programs into the League. 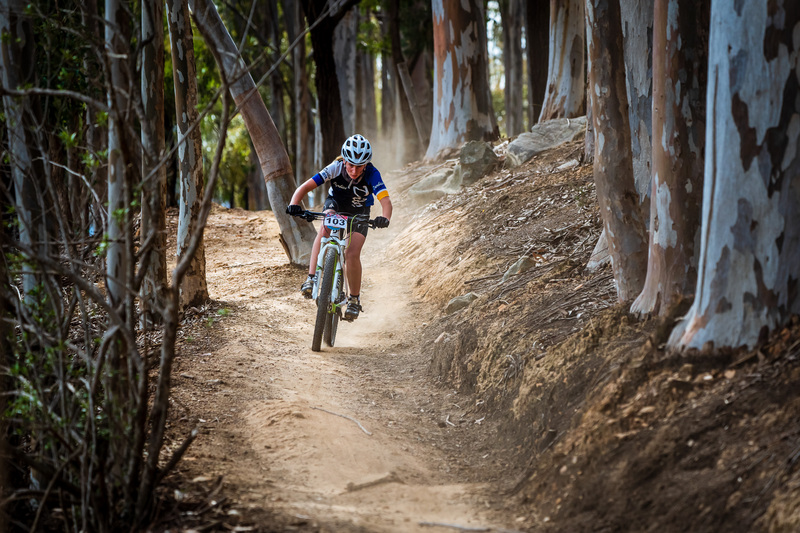 Currently, the official Spur High School MTB League require that teams qualify by generating points at four (or six, depending on region) qualification races. Big teams invariably make more points, but because more points are earned for higher placings, you find that 10 strong riders will beat 50 mediocre ones. Girls generally earn points easier. The key is that a school needs to attend the races as team of riders. The League understands the respective challenges each region faces. We also know that in terms of merit qualification there are certain regions where this will be easier, some certainly harder. The Gauteng, Mpumalanga and Western Cape regions can be deemed tough qualification zones as the school teams are well developed. Limpopo, Northwest and KZN can be considered intermediate zones. The Northern Cape, Eastern Cape, Freestate offers the easiest qualification path. These are also our smallest local Leagues in terms of numbers. At the National Final, a boys team result is made up of the 5 best boys results over all categories, for mixed teams we count 3 boys and 2 girls, and for girls teams the best 3 girls results. It is therefore important to consider these permutations when selecting riders and teams. For the Singlespeed League, our focus will be on building mass participation structures to develop teams to join the main League. Our main objective will be to develop the school teams first. Once in place, we can focus on gearing these teams to become more competitive. 1) Identify a suitable community to host the event. Usually there are already an active individual in the area keen to see an event take place. 3) For talent ID purposes we need a 1,5-2km lap with mild undulations. 4) Good venues are in close proximity to schools, so that access does not become a limiting factor. If kids can walk to the track, you’ve got a winner. 5) You’ll need 20-25 singlespeed bicycles. These are divided in medium and large models. Talk to Amarider regarding good rates on bikes. We run Avalanche Charge 10’s that’s been beefed up with better stems, clamps, forks and tyres. 6) 50 helmets. (Double the number of bikes so waiting riders can get kitted out while race is running. 8) Line kids up based on birth year. For 2018, birth years of 2004/2005 = Sub Junior, 2002/2003 = Youth, 2000/2001 = Junior. Or 13/14 year-olds, 15-16 year-olds and 17-18 year-olds. Our focus for the initial roll-out will be on high school learners, as our Finals is only for secondary schools. 9) 20-25 kids at a time does 1-2 laps of the track. Older kids can do more laps. The first 5-10 (based on total participation) to progress. Each of these top finishers gets a disc/ token to hand it when called to final race. 10)We run qualifiers for each age category starting with sub-juniors. Once all qualifying races are done, we call the qualifiers for the finals. Again, riders race per age category. 12)For finals hand out discs numbered 26 (winner) to nr 1 as riders finish to help with tallying points. Riders take their disc to admin table where points are allocated to the respective school. After meeting points are tallied to identify school rank. This eliminates the need for timing. 13)The outcome would be a final where the top 20-25 per age group for boys and 10-15 for girls (assumption that we’ll have lower female participation) race in a final. Those that got eliminated of course stay to cheer on their friends. Each school gets assigned a bib of a certain colour. We assume that the kids do not have sports kit so the bib immediately identifies the blue, green, white, orange, red etc teams. This makes it easy for spectators to cheer for their favorite teams. 200 kids pitch for the event. They represent 5 schools. We have 25 bicycles. Put 5 bikes aside in case there are breakdowns and to allow for size curves. 2) Call all 14 year-old boys and line them up. Do the same for other categories. 3) Ensure that bib colours are mixed so that one qualifier is not loaded with one school only. 4) Determine how many boys are in the group. 5) Say there are 50, split the race into 3 groups. 2×17 and 1×16. We keep the number of participants just below our number of active bikes. This gives us 3 heats and we can decide to have 6 qualifiers per heat, giving us a final of 18 riders. 6) Remember to identify the qualifiers. An easy way to do this is to remove the bibs from riders who have not qualified. 7) How we split the groups is largely determined by the number of riders and timeframe. Girls group are normally smaller so one can adapt the program to suit low numbers. Say there are only 6 junior girls you can make them race twice, once for practice, and the second time for points. Large groups might require a 2nd round of qualifiers before the final. The more racing opportunities for a kid on the day, the better! 9) Catch the names of the top 3 riders in each final, they will be called up at prize giving. 10)At Prizegiving, we award the top 3 positions in each catgegory, and then call up our winning school. It takes time, energy and funding to develop a successful schools cycling team. The key is a program of structured participation opportunities so these teams can set goals, budgets and measure their progress. What these participation opportunities look like differs from region to region. In some regions, there are events every weekend, others barely have a calendar and participation requires traveling long distances. The program needs to be flexible and adapt to local resource, accessibility and scope. Further, it is important to package your program into an annual season to ensure focus and prevent project burnout. Each region is going to require a bespoke structure to determine the path to eventually enter the Spur Schools Mountainbike League and we must accept that models are going to differ. Importantly, teams are already participating and getting better all the time, we just need to stimulate, instigate and support this process and we’ll see. 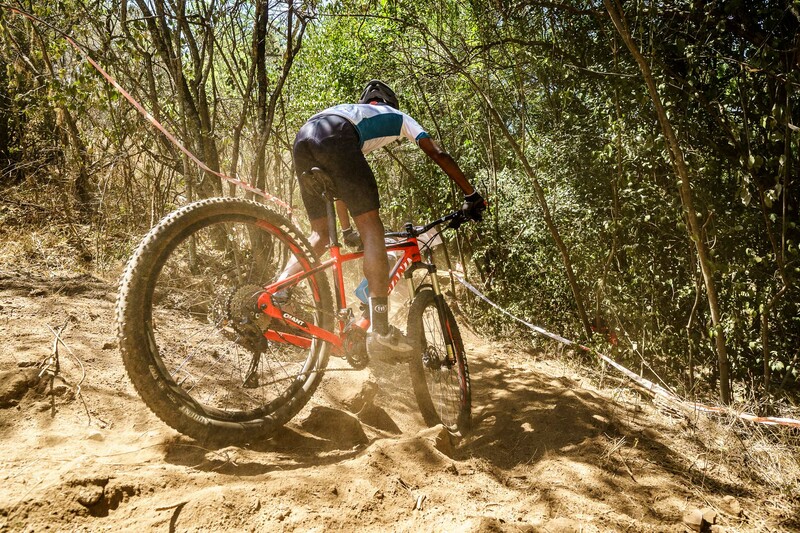 A big step in the right direction was taken for mountain biking with the introduction of the first Single Speed event in Soweto on Wednesday, 5 July 2018. Over 190 excited riders represented over 13 schools from the local area at the Soweto Schools MTB Challenge which resulted in Ibhongo Secondary High School being crowded the day’s Champion School. 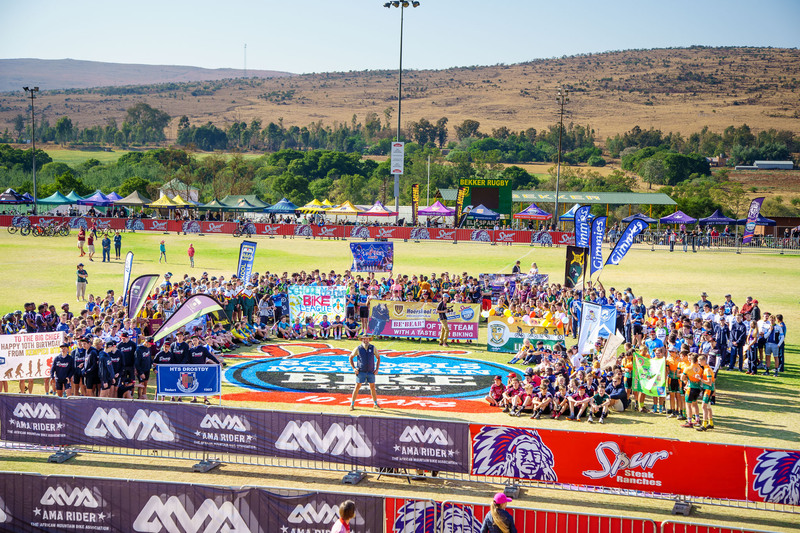 Each school was allocated a colour bib, which was proudly worn by riders and team coordinators alike, and each heat starting off batches of approximately 15 – 20 riders on single speed mountain bikes. 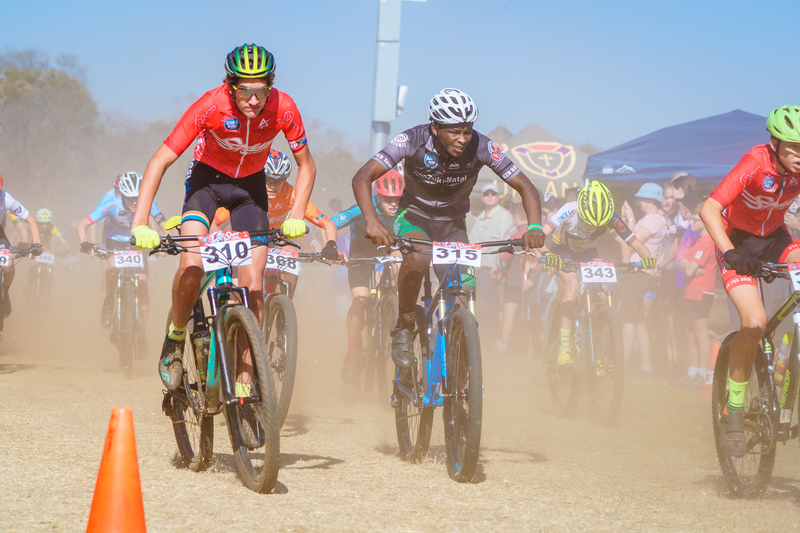 Eagerly chasing around the marked out course at Mapetla Park, Protea North, the top 5 riders of each race qualified to ride again in the knock out races. It wasn’t long before the boys were racing across the finish line, trying their hand at fancy skid-stops and doing winning celebrations. 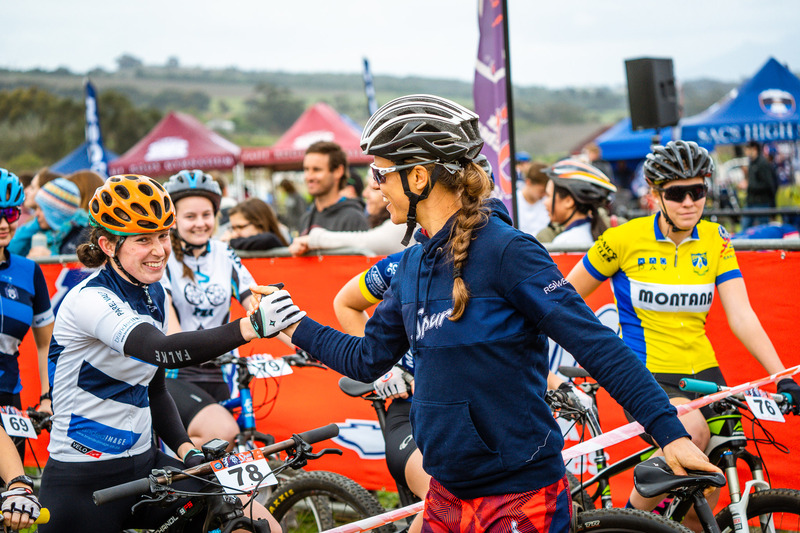 What is more exciting is the fact that the girl’s category was also well represented with approximately 15 girls, all vowing to take on mountain biking in the near future. As the last of the knock out races finished up, each participant and school representative was treated to a Spur burger and chips which wrapped up in a well-received prize giving for the top boys, girls and Champion School. By linking up with local organizations, like in this case with Soweto Cycling Club, the Single Speed format is sure to grow mountain biking around the country from grass roots level and will ensure a healthy pathway through the correct channels. A big thank you goes to the Soweto Cycling Club and Amarider for putting a successful event together as well to Spur Steak Ranches who sponsored the event under the Spur Schools Mountain League banner.